As students began classes last week at Wayfinding, there were several changes that people new to the building would not have noticed. Crew offices had been repainted and rearranged, but more importantly they no longer housed the same people. The crew who mostly support the work of the college and do not interact with students on a daily basis now occupy the offices downstairs. Upstairs, where classes are normally held, the crew you’ll find are those whose day-to-day focus is serving students. With good reason, we decided it was time for a swap. Two years ago, the Wayfinding crew who first welcomed Cohort 1 was comprised of creative and daring people who were excited to start something completely new. They dreamed together, and together they built a college from scratch, giving Wayfinding its all-important foundation by cementing its values in place. The crew did not worry about titles or job descriptions. They just wanted to create a college where the student, the whole student, comes first. It has long been understood that the place in which someone learns affects how they learn. The first rooms to be set up at Wayfinding HQ were the student classroom spaces, and students often think of the building as home. There are cozy places to quietly work or study, shared spaces for meetings or chance conversations, and no barriers exist between students and crew, faculty, guides, or anyone else who comes through our doors. We are all part of the Wayfinding community, and in any community there will naturally be growth, conflict, and change. The makeup of Cohort 1 changed, as has Cohort 2, and members of the original crew began this adventure knowing that their time would be finite. They helped see the college through its first stages of transformation, and as it continues to grow and transform, they still are still a part of our community. They are no longer as active day-to-day, but they still attend events, check in, and look on, eager to see what happens next. Everything sits in the Navigation Hall, waiting for its new home. In the two years since Cohort 1 first stepped through the doors at Wayfinding Academy, a lot has changed. 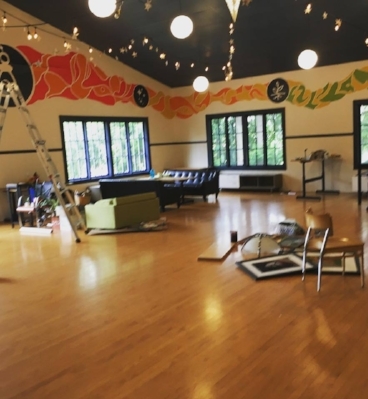 The formerly bare walls of the Navigation Hall are now encircled by a colorful mural designed and painted by Cohort 1 student, Austin, who had plenty of thematic help from the Wayfinding community. The founders’ wall hangs in the commons, a colorful assemblage of tiles that catch the light as students study, and Cohort 3 is working with new Guides as well as some new faculty members who are teaching several core courses. On top of this, the current crew has decorated and painted their new offices. They are settling in for the new year, making the spaces their own as they invite students to continue growing, stretching and exploring. In start-up culture, organizations face challenges after the initial momentum dips. As organizations scale up, retaining their values and their culture is essential, and it’s important to confront changes fearlessly. Our students are taught to explore feelings of uncertainty and discomfort. They are taught to stretch by challenging themselves constantly. They are taught to try, and to fail, and to always question and to always learn. As an organization, we have to be prepared to do the same. We call our current time of transformation “The Great Crew Office Swap.” It represents another cycle in the life of Wayfinding, an intentional and visible reaffirmation of our core value to always support our students first, to always learn, teach, serve and explore. Together.